gives you the Overall Picture of what is happening behind the scenes of each Futures market. It actually tells you who’s buying and who’s selling; that information is just way too important to leave to chance. 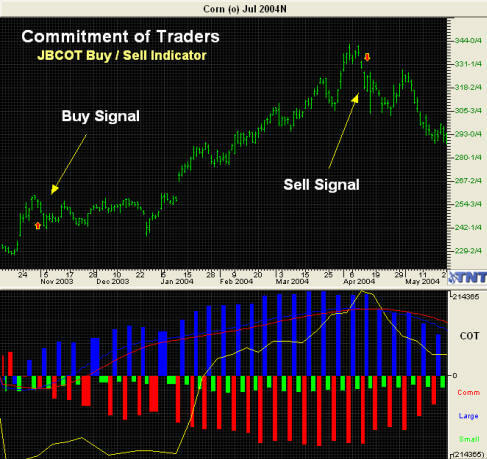 Without knowing the COT, you’re basically trading blindfolded; this information is absolutely “key” to your trading success! Yellow Line: The overall open interest in the market. Notice that the Red bars are all pointing down, which indicates that the Commercials are all selling, or going short. Notice that the Blue bars are all facing up, which means the Large Speculators are buying, going long in the market. Basically, the Red guys, the big Commercials are selling their contracts to the Blue guys, the Big Speculators. Look at the little Green guys, they are the Small Speculators, guys like you and me, who are also going short, or selling, that’s why their bars are all facing down too.